Ante wins another Best In Show! The day after winning his first BIS, Jet’s Leave The World Behind, Ante, repeats the success to og back-to-back Best In Show. Many congratulations to owner-handler Inger Pedersen! Griffon Double in the UK! Many congratulations to Ante, Ch. Jet’s Leave The World Behind and owner Inger Pedersen on winning Best in Show at Kvalsund, owner-handled! 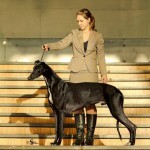 Ante thus becomes Jet’s 44th homebred Best in Show winner. 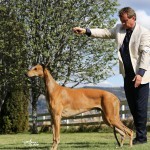 Ole is a Nordic champion: the smooth Griffon Jet’s Arthur Miller, Ole, owned and shown by Anita Weirud, recently won his Swedish and Nordic champion titles. Congratulations to another win for Ole and Anita.